High-quality replacement 16uF start/run capacitor for pump motors used on Hot Tubs & Spas. 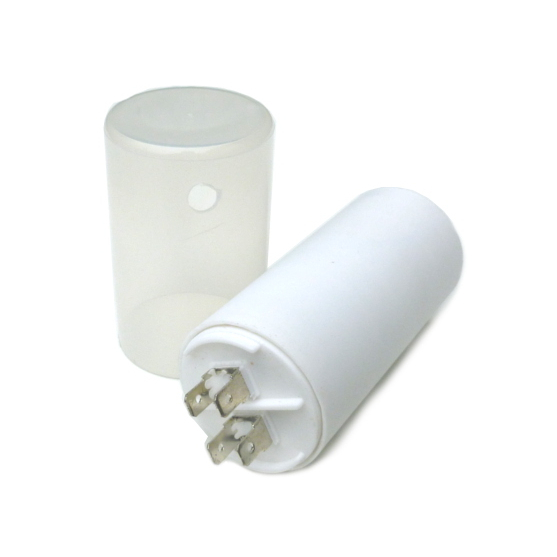 Our 16uF hot tub pump capacitors are designed to fit the electrical housing on most hot tub pump motors. They include a mounting stud, nut and end cap so they can be mounted externally to the motor if required, these can be also cut off to fit within a limited space. The 16uF capacitor is very common as 90% of 2hp 2 speed hot tub pumps use this 16 microfarad rating for the low speed. This exact part can be used as a replacement for many Waterway and Aqua-flo pumps. Connections: These 16uF capacitors have four male spade terminal connections but in most cases, you will only require to use two of them. It does not matter which way round you wire these but make a note that there is a moulded dividing line between a pair of terminals and you will need to attach your two wires either side of this line. Warning: Please do not attempt to install this capacitor to your pump when the pump is still running as they run at high voltage and can cause an electric shock and possible injury. It can be a bit confusing choosing the correct hot tub parts for your hot tub pump as brand names and models are not always written on them. The quickest way is to simply send us some images of the complete hot tub pump you need the replacement parts for through our Contact us page and let us do the work for you.